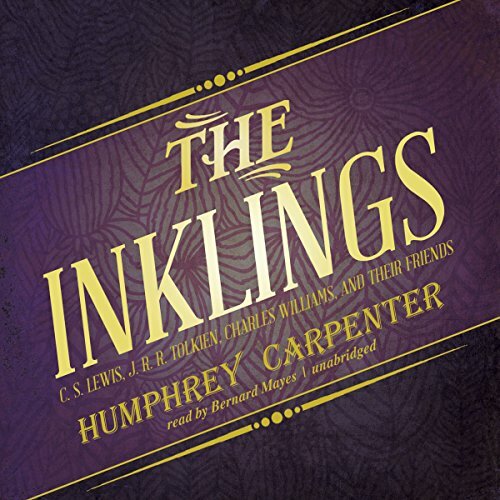 Author Humphrey Carpenter was born in Oxford and was acquainted with Tolkien, Hugo Dyson, and several other Inklings. In this remarkable reconstruction of their meetings and momentous friendships, Carpenter brings to life those warm and enchanting evenings in Lewis' rooms at Magdalen College, when their imaginations ran wild. His account offers exciting insights into the influence these brilliant individuals had on each other's developing ideas and writing. ©1990 Humphrey Carpenter (P)1990 Blackstone Audio, Inc.
What an insightful account of a remarkable group. To bring this group from a possible fate of being simply an academic footnote to a fascinating and informative account of creative humanity is a tour de force. The vignettes of less well known members of the group are marvellous. And Bernard Mayes’ reading of it is wonderfully warm and clear. Good narrator (he sounded very much like Michael Caine to me), and I was willing to overlook his mispronunciation of some of Toklien's words. It was a thorough and well rounded accounting of the Inklings, albeit with a heavy focus on C.S. Lewis. The chapter of dialogue imagined by the author where Tollers reads his draft of Moria will be listened to again. Excellent history. Was surprised Tolkien wasn't a fan of Narnia. Charles Williams was an interesting character. A really fascinating and informative biography and analysis of some great 20th century writers. We listened in rapt attention right to the end. A well written study of the Inkings where the argument is made and justified that C.S. Lewis was the reason for their formation and essentially the glue that held them together. With making this argument, the book at times turns more into a biography of Lewis, touching moderately on Charles Williams and sparingly on Tolkien. Overall, a comprehensive study essential to anyone interested in Lewis, Tolkien, Williams or the Inklings as a group.